The Fiery Blowhog (ブタドックリ?, lit. 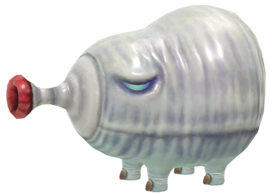 : "Tokkuri Pig") is an enemy in Pikmin, Pikmin 2, and Pikmin 3, and a boss in Hey! Pikmin. As its name would imply, it shoots fire from its red snout. They are only found in The Forest Navel and are larger than in the other main Pikmin games in Pikmin, but are found commonly in Pikmin 2 and Pikmin 3. Like all bosses in Hey! Pikmin, only one appears in the game, in Blazing Winds. In the first two games, when provoked by Pikmin, Fiery Blowhogs will buck them off into an area in front of them and shoot fire. In Pikmin, it can be extremely difficult to save burning Pikmin, but blowing the whistle within the area of the Blowhog's attack will ensure that any Pikmin caught in the flames will instantly be extinguished. In Hey! Pikmin, its behavior is a quite different from the main games in the series: this beast stands on top of a pillar and shoots fire at Olimar down below. It is normally too far up to reach, but can be stunned with a bomb rock, and by sneaking to its backside, the player can throw Pikmin at the part of its body that slipped off the platform. As it is now a boss, it is much larger than in the main Pikmin games. It drops the Shimmering Skull when defeated. A younger variant can be found in this game, the Fiery Blowlet. Fiery Blowhogs also have lightly colored segments that are barely visible in-game, but more noticeable in the creature's artwork. These became more visible in Pikmin 3 and Hey! Pikmin. Fiery Blowhogs typically wander around a very small zone aimlessly – they aren't stationary, but they won't move a significant distance from their home territory. Once a Blowhog has detected the presence of a leader and/or Pikmin, it will rotate to face them, before spewing out a stream of fire. Although the Fiery Blowhog waits for an opportune moment to begin exhaling, it must inhale first, which creates a short delay before firing in which the attack may be avoided. From the moment the creature begins inhaling to the moment it's done spitting fire, it will not rotate or move, meaning the spray of fire will not follow leaders or Pikmin running away. If the Blowhog is under attack and not currently exhaling, it will buck itself forward and immediately shoot flames in the direction it was facing, though it must still inhale first. This bucking motion occurs regardless of whether the Blowhog is being attacked by Pikmin clinging to its body or not. In Pikmin 2, Blowhogs may not shoot fire if only a leader is present nearby. This can be seen by keeping a leader very close to the creature. Also in this game, an idle Blowhog will only turn to the left to change in which direction it wanders. When engaged in combat, however, they can also turn to the right. At the start of the battle, the creature points its snout in Olimar's general direction, inhales for some seconds, and then spits a steady stream of fire, all without changing the direction of the snout. The flame attack lasts for some seconds, and after it stops, the cycle repeats. This fire, naturally, will not hurt the Red Pikmin, but will damage Olimar. It won't trigger any bomb rocks on the generator, but will trigger bomb rocks that Pikmin are carrying. The suction attack will not be strong enough to do anything to Olimar (even if he's riding his jetpack), or to Pikmin on the ground, and if Pikmin are thrown at the snout, they will squeal and get trapped in the air for a bit, but will eventually fall back down. If the player enters a doorway to go to the other side, the creature will finish its cycle, and will then turn around to face Olimar before it starts a new cycle. If while it's inhaling, a bomb rock Pikmin is thrown at the snout, the Pikmin will let go of the bomb, and the Blowhog will inhale it. It will only catch one bomb rock, so if more bomb-carrying Pikmin are thrown, they will just drop their explosives in the air. The rock is too big to go inside the snout, so it gets stuck at the entrance for a second before it explodes. When it does, the Fiery Blowhog gets thrown back and starts hanging from the ledge it's on, with its backside dangling, and at the reach of Pikmin. It will stay this way for some seconds, until eventually it climbs back up, jumps on its platform, and causes boulders to fall in random places, but near the center of the arena. If its health reaches two thirds while it's dangling, it will shake the Pikmin off, get back up, and jump on the platform to cause boulders to fall like before. But this will also signal some changes in its attack pattern: at the start of the cycle, it will inhale for only a split-second, and will then spit three fire balls. It will change direction slightly to face Olimar each time it shoots a fire ball. 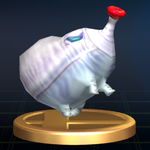 After that, it will perform the usual long inhale, followed by the stream of fire, but will also slowly turn its snout to Olimar as it expels fire. If the player goes to the other side of the area while the beast is spitting balls of fire, it will stop, turn around, and will restart the cycle by quickly inhaling and spitting three balls of fire again. To note is that the quick inhale cannot capture bomb rocks, and that the fire balls can ignite bomb rocks, whether they are on the generators, or in the hands of a Pikmin. Like before, if it is health reaches the last third while it's dangling, it will shake the Pikmin off, climb back up, and jump to summon boulders, but will change its attack pattern once more. From here on out, the quick inhale will be followed by three volleys of three fire balls each. The fire balls spread out, each following its own angle, and once again, the creature will slightly change direction each time it exhales. After that comes the long inhale and stream of fire, except it will rotate even faster when it spits out the stream. Red Pikmin are recommended, but if you're careful, it can be taken out with any type of Pikmin. To start off, throw a single Pikmin directly onto the Fiery Blowhog (preferably a leaf Pikmin so it doesn't get deflowered). Immediately after the Blowhog throws the Pikmin off, swarm it with the entire group. If it is evident that it will survive this attack, call back the Pikmin swarming it before they can get knocked off, then re-swarm the Blowhog. Repeat until it's dead. Pikmin that are swarming a Fiery Blowhog cannot be ignited, meaning they're safe from its attack. You could also leave a group of Reds near a Fiery Blowhog, (recommended leaf), and they cannot be killed, unless the Fiery Blowhog bucks them into water. Make sure you make the Blowhog faces away from any water sources. The same strategy described above works equally well here and since they are easier to kill in Pikmin 2, a large Pikmin group can swarm it right away for the kill. Obviously, throwing Purple Pikmin on it will deal serious damage to the Blowhog, as well as rendering unable to buck the Pikmin off, or breathe fire. The strategy described for the first game works just fine still, only you don't need to take as much caution, since Pikmin cannot be deflowered by the bucking attack now. This means that unless a Blowhog can potentially buck them into water, it poses virtually no threat to Red Pikmin. Henceforth, to save time, its easy to just leave a small group of Red Pikmin attack a Fiery Blowhog, go off and accomplish some other task, and by the time you return, the creature should be dead, and all your Pikmin should be fine. Or if you have a large army of Red Pikmin, just send them all charging at the creature and it will be dead within a few seconds. If it manages to buck them all off, just whistle them back and repeat the process. You can be particularly careless if you've obtained the Scorch Guard upgrade, prevent your leaders from being damaged by the fire. If no Red Pikmin are available, take caution and attack from the rear. Whistle the Pikmin off every time the Blowhog begins to buck and repeat the process to take it out without much of a problem. If any clovers are nearby, this process becomes even easier, and you can lose its attention to get a shot at the rear. Start by luring the Blowhog into inhaling near the center of the arena. While it's inhaling and spitting fire, it will not turn to you, so take this time to grab a bomb rock. When it begins inhaling again, throw a bomb rock at the snout. If its fire touches the bomb rock, the Pikmin holding on will let it go, and the timer will start counting down, so beware. As soon as you throw the bomb rock, enter a doorway to go to the other side of the stage, and quickly throw Pikmin at its backside. If you're quick, the creature's health will freeze at the two thirds mark, and it will shake the Pikmin off, but if not, you'll have to repeat the cycle until that happens. Every time it climbs back up, it will jump on its platform and cause boulders to fall, but these can be easily avoided by standing near the edges of the arena. Once its health is at two thirds or less, it will start each cycle by inhaling quickly and shooting three fire balls. Dodge each one, and try to obtain a bomb rock during this time, but don't swap sides, since that will just cause the creature to turn around and restart the fire ball sequence. Afterwards, it will do the long inhale and spit a stream of fire, but this time, it will slowly turn to you. Throw the bomb rock at its snout while it's still inhaling, like before, but if you can't, escape from the stream however you can, even if you have to enter doorways. Just like before, this pattern will be repeated until you get its health down to the last third. From here on out, when it does the quick inhale, it will shoot 3 volleys of 3 fire balls each, which spread out. These fire balls aren't particularly hard to dodge as Olimar, but it is very difficult to avoid having a bomb rock Pikmin touch one. As such, you should try to obtain a bomb rock right after it shoots out its third volley. To make sure that you have enough time and space to get a bomb rock, go on one corner of the arena at the start of the cycle, lure it into shooting the first volley near that edge of the arena, and by the time it starts the second, race to the opposite end. The Blowhog will not turn enough to shoot the final three fire balls at the other corner of the arena, giving you enough time to grab a bomb rock, and to get ready to throw it during the long inhale attack. If you couldn't, and the creature ended up launching fire, know that it will follow Olimar even faster, perhaps making it impossible to dodge by simply running to one side of the arena. Enter a doorway to escape, if you must. If you want to be quick, as soon as the boss battle begins, run to the left and get a bomb rock. The creature should be turning to face you just as the Pikmin returns to you, so quickly throw the bomb rock Pikmin at its snout, since it will start inhaling very quickly. Afterwards, just make sure to have a bomb rock ready every time it starts the long inhale attack. Use the strategies in the previous paragraphs to help make sure the bomb rock isn't dropped during the other attacks. To note is that the bomb rock explosions cannot reach the creature when it's dangling. The Fiery Blowhog appears as a trophy in Super Smash Bros. Brawl. “A member of the blowhog family characterized by its bottle-shaped body and slow lumbering movement. Skillful in the use of its red snout and able to violently shake off Pikmin, the fiery blowhog is also capable of spitting a volatile phosphorous compound that combusts on contact with air, threatening nearby enemies. Japanese name: ヒフキブタドックリ?, lit. : "Fire Breathing Tokkuri Pig"
The name "Fiery" is, of course, due to its ability to spit out fire. In Japan, it is known as the ブタドックリ?, which translates to "Tokkuri Pig". The "Pig" part comes from its body shape and the sounds it makes. Its scientific name is Sus draconus; draconis is Latin for "dragon", once again referencing its ability to spit fire. Internally, the creature is called tank in all games; the reasoning behind this name is unknown. Artwork of Pikmin carrying a Fiery Blowhog carcass from Pikmin. A Fiery Blowhog spewing fire at Red Pikmin in The Forest Navel. The Fiery Blowhog in the enemy reel at the end of Pikmin. A Fiery Blowhog shooting flames in Pikmin 2. The creature's e-card, #15 (4th red card). A Fiery Blowhog as seen in Pikmin 3. Two Fiery Blowhogs in Pikmin 3, with a Yellow Wollywog in the foreground, in a prerelease version. Alph attacking a lone Fiery Blowhog with his squad of Red Pikmin. A dead Fiery Blowhog being carried by Rock Pikmin. A Fiery Blowhog with a data file in the background. Fiery Blowhogs in the rain. Closeup of a Fiery Blowhog. The Fiery Blowhog in Hey! Pikmin idling. Shooting a lone fire ball. Fiery and Watery Blowhogs are one of the few Pikmin enemies to have a figurine modeled after them. Fiery Blowhogs are one of the enemies that can be rolled on the roulette wheel in 2-Player Battle. In Pikmin 2, an orange liquid can be seen dripping from the Blowhog's snout, right after it spits fire. This page was last edited on April 19, 2019, at 16:35.